It impressed audiences when it was revealed at the Geneva Motor Show in March 2016, and will be available as a conventional hybrid, a plug-in hybrid, or an 'electric-only' model. Contact our helpful sales team today to register your interest in the new model. The five-door Ioniq has a neat, modern style, with a prominent grille flanked by wraparound headlights and large air intakes that emphasise its performance. A low roofline gives it a coupé-like appearance, as well as reducing its drag coefficient to just 0.24 – benefiting both performance and economy. Efficiency figures are yet to be released, but the original Korean edition achieves combined fuel consumption of 63.3mpg. In the past, many hybrid cars have found their loadspace and legroom confined, due to the presence of a bulky battery. Hyundai’s innovative engineering has rendered this less of a problem; the vehicle offers excellent headroom and legroom for front and rear passengers, along with a highly respectable 750 litres of loadspace. The new Ioniq’s 1.6 litre, 104bhp “Kappa” naturally-aspirated petrol engine provides class-leading thermal efficiency and ready performance by itself, and this is only enhanced by the 43bhp electric motor. The combined torque output of 265Nm gives the Ioniq the ability to reach a theoretical top speed of 115mph. A dual-clutch six-speed automatic transmission enables silky-smooth acceleration. The Ioniq comes in a single, well-equipped trim level, with numerous advanced features to enhance safety and convenience. A 7” high-resolution TFT screen offers access to a variety of infotainment functions; it also comes with a seven-year free subscription to TomTom LIVE services, which give you updated information in real time on weather, traffic, speed cameras, and points of interest. Dual-zone air conditioning and smartphone integration also help to keep you comfortable and connected. 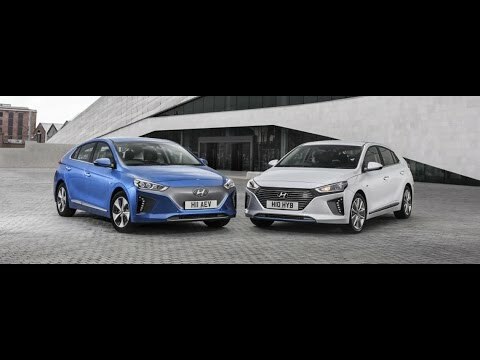 The all-new Hyundai Ioniq is available to test drive at Berkeley Vale in Thornbury, Gloucestershire. Now in both Hybrid and Full Electric versions! Contact us to book your Test Drive and receive the latest info.